In 1938, Handler began crafting art objects from Lucite in the LA garage of Harold “Matt” Matson. Soon he was in business as Elzac Jewelry, with Hollywood starlets modeling his designs. When Handler and Matson left Elzac and went into business as Mattel, (taken from each of the founders’ name) the year was 1945 and with the nation at war, plastics were restricted for military use. Innovators that they were, they began selling wooden picture frames and quickly branched out into dollhouse furniture, before changing their emphasis to toys. 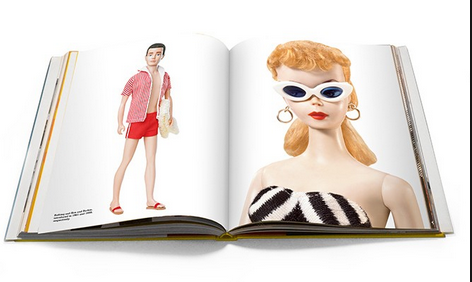 Fast forward to when Barbie was born in 1959 and one year later Mattel became a publicly owned company. In the following years, Mattel launched other iconic toys, including Hot Wheels and He-Man; began incorporating other brands, such as Fisher-Price, Pleasant Company (including American Girl), and Tyco Toys; and entered licensing agreements with Disney, Nickelodeon, and Harry Potter. Celebrating the spectacular history of the Mattel family of brands, this volume brings together archival images from the early years of Mattel and original photography of some of Mattel’s most iconic toys to express the joy and energy of all the toys since its founding, a fantastic tribute to the happiness of childhood and the enduring memories of life’s best moments. Readers of all ages will delight in rediscovering their favorite toys and learning the stories behind them.